Aim: To compare push-out bond strength between self-cured and dual-cured resin cement using a titanium post. Background: Dual-cured resin cements have been found to be less polymerized in the absence of light; thus the bond strength of cements would be compromised due to the absence of light with a metallic post. Materials and Methods: Ten extracted teeth were prepared for cement titanium PARAPOST, of five specimens each, with Panavia F [dual-cured (PF)] and Rely×Luting 2 [self-cured resin-modified glass ionomer luting cement (RL)]; the push-out bond strength (PBS) at three different levels of the sectioned roots was measured. The failure modes were observed and the significance of the differences in bond strength of the two types of cement at each level and at different levels of the same type was analyzed with non-parametric tests. Results: The push-out bond strength of the RL group was greater at all the three levels; with significant differences at the coronal and middle levels (P<0.05). No significant differences in PBS at different levels of the same group were observed. Cement material around the post was obvious in the PF group. The failure mode was mostly adhesive between the post and resin cement in the RL group. Conclusion: Bond strength was greater with self-cured, resin-modified glass ionomer luting cement, using titanium post. The restoration of endodontically treated teeth frequently poses a challenge for the clinician. Clinicians usually choose the post and core system that provides the best retention and support, and reduces the possibility of root fracture. , Prefabricated posts are fabricated from different materials such as metal, carbon fiber, ceramic, and glass fiber posts. Application of the titanium post has become very popular due to its excellent biocompatibility and physical properties, such as low density, high mechanical strength, and high corrosion resistance. Cements including zinc phosphate, polycarboxylate, glass ionomer, and resin composites have been used to cement endodontic posts. The retention of a post varies, depending on the type of cement, its mechanical properties, and dentine structure. , The use of resin composite luting cements have been reported to reveal superior post retention and less solubility and microleakage, when compared with zinc phosphate cements, and are being used to cement both non-metallic and metallic types of endodontic posts. Moreover, recurrent caries had not been detected using different post and core systems. Resin cements can be categorized according to the polymerization type; chemically cured, which is mostly used for metallic restoration, requires a long setting time, and has an uncontrollable working time. In contrast, light curing resins are not recommended for post cementation because of the inadequate depth of cure in the apical portions of the root, even if translucent posts are used. Therefore, dual-cured resin cements afford better control during the cementation procedure and are expected to harden in deep areas, where the curing light cannot penetrate. , Even as the evaluating bond strength of resin cements at different depth with fiber post materials, higher bond strength was observed at the coronal level. Contradictory results were observed by Karin et al. in which higher bond strength was observed the at apical level. Polymerization of dual-cured resin cement may be affected if the curing light does not reach the cement; thus dual-cured cement needs to rely on an autopolymerizing component. Depending exclusively on the autopolymerizing component of the dual-polymerizing composite, the resin has decreased hardness and premature failure of the cement. , Considering the fact that resin cements have been advocated to bond with the metallic posts, effects of the curing mode of resin cements on the bond strength with metallic posts need to be evaluated. Even as most of the above studies have focused on fiber post materials to evaluate the bond strength of resin cements, limited studies are available on the bond strength evaluation of metallic posts, using resin cements with a different curing mode. Thus, the purpose of the present study was to evaluate the push out bond strength of dual-cured and self-cured resin cements with titanium post. Ten freshly extracted maxillary incisors with similar root length were selected for this study. The selected specimens were stored in normal saline solution until the beginning of root canal obturation. Each tooth was sectioned with a tungsten carbide rotary cutting instrument (Multi-purpose™ Bur, Dentsply Maillefer, USA) under a water spray, 1 mm coronal to the cementoenamel junction (CEJ) to remove the crown portion. The coronal surface of each root specimen was flattened with a finishing diamond rotary cutting instrument to obtain a surface perpendicular to the long axis of the root. Root canal preparation was performed at a working length of −1 mm from the apical foramen using K-files (MANI, INC, Tochigi, Japan) with a step back technique. Sodium hypochloride solution (5.25%) was used to irrigate the canals throughout instrumentation. The roots were dried with paper points and obturated with gutta percha points by means of cold lateral condensation, with eugenol-free polymeric calcium hydroxide as a root canal sealer (Sealapex™, Kerr corporation, United States). Subsequently, the pulp chambers were filled with temporary filling material (Ceivitron, RECO-DENT International Co., Taiwan,) and stored in normal saline (0.9%) for 24 hours. For cementation of the titanium post, the root canals were enlarged with a low speed drill of the endodontic post system (PARAPOST® XH™, Coltene/Whaledent Inc, USA). The depth of the post space preparation was 10 mm. Post space preparations and selection of the post diameter size was done in such a way that the difference between the size of the post drill and titanium post diameter was consistent in all samples, which was 0.50 mm in diameter. Irrigation after preparation was performed with sodium hypochloride (5.25%), and then the post spaces were dried with paper points. The samples were randomly divided into two groups. The detailed composition of materials that were used for cementation of the metallic post is shown in [Table 1]. Five specimens were treated with dual cure resin cements (Panavia F (PF), Kurary Medical Inc., Japan) following manufacturer's instruction. Each canal was conditioned with an adhesive primer (ED primer, Panavia F, Kuraray Medical Inc., Japan), which consisted of liquids A and B. One drop each of liquids A and B were mixed and applied to the post space walls with a microbrush provided by the manufacturer. Excess primer was removed with a paper point; the remaining material was gently air-dried. Equal amounts of Panavia F paste base and catalyst were mixed and applied to the post space walls and titanium post was cemented and light cured for 20 seconds. An oxygen barrier (Oxyguard II gel, Kuraray Medical Inc., Japan) was applied to the superficial margins for three minutes and then removed with cotton rolls and water spray. Five specimens were treated with self-cured, resin-modified glass ionomer luting cement (Rely X™ Luting 2 (RL), 3M ESPE, USA), following the manufacturer's instructions. The paste was dispensed in equal volumes by fully depressing the clicker lever and mixed for 20 seconds using a plastic spatula, until a uniform color was achieved. A thin layer of cement was applied into the post space by using the post. The post was seated with light pressure for two minutes, and then the excess cement was removed. Specimens of both groups were kept in a light proof environment for 24 hours, at 100% humidity, until the moment of sectioning. Each tooth root was horizontally sectioned with a diamond band saw under water irrigation (EXAKT 300 and EXAKT 310 diamond band saws, Germany). The root-post was sectioned off into 3 mm thick sections perpendicular to the long axis of the tooth. The first sectioned specimen that started from the CEJ represented the coronal region, the following one the middle region, and the last one the apical region of the tooth root. The sectioned specimen was positioned for push-out bond strength (PBS) measurement at a cross head speed of 0.5 mm/minute by Instron, model 8874, USA. A custom-made push pin was set in a universal testing machine perpendicular to the post surface. A hole slightly larger than the post diameter had been made on the steel plate so that the pushed out post was not obstructed during debonding. Examination of the debonded post specimens was observed using a microscope (Leica DMLM, Leica Microsystems, Bensheim, Germany). We applied the non-parametric Analysis of variance to assess the statistical significance of the differences (P<0.05) among the groups; The Mann-Whitney U test was applied to analyze the bond strength of the two types of cement at each level and the Kruskal-Wallis was applied to analyze the same cement type at three different levels (coronal, middle, and apical), using the SPSS version 18 (SPSS Inc., Chicago IL). Significantly greater PBS were observed [Table 2] in the RL group of specimens at the coronal and middle levels (P<0.05). The PBS at the apical region of the PF group was less compared to the PBS at the apical level of the RL group, but not significantly different. No significant difference in PBS at different levels of the same group was observed. The presence of cement materials around the debonded post surface at each level was obvious in the PF group. Failure mode was mostly adhesive between the post and resin cement at all three levels with RL. Results of the PBS values are shown in [Figure 1]. The tendency of higher PBS was observed with the RL group at each of the levels tested; the results showed significantly higher PBS at the coronal and middle levels with the RL group of cement. Polymerization shrinkage due to more available curing light was probably responsible for significantly less PBS at those levels within the PF group. RL cement was self-cured, resin-modified, glass ionomer cement, and it was assumed that the polymerization shrinkage phenomenon might be less with this type of cement. Moreover, cement adaptation with either the post or dentine surface might play an important role in the ultimate bond strength value of the post system. A previous study on resin luting cement observed voids and bubbles around post materials, which were often detected within the resin cement. It was important to evaluate the relationship of polymerization of resin cement and uniformity of the cement adaptation with the root canal wall, as voids and bubbles could obviously affect the bond strength of endodontic posts. Vichi et al. found that the percentage of bubbles (30 - 60%) increased with the viscosity of the cement, while Grandini et al. noted a large number of bubbles or gaps when the adhesive and cement were photopolymerized in one step (30%) rather than two (10%); the adhesive and luting cement were photopolymerized in one step in the PF group of cement in the present study, thus there were increased possibilities of the formation of bubbles or gaps that could be a contributing factor for less PBS observed in that group. The application of resin cements with a lentulospiral instrument was used in previous in vitro studies. Even though it was not recommended by the manufacturer, it was reported as an effective technique to reduce voids and bubbles within the luting agent. As applying the cement to the post space with a lentulospiral instrument could result in an early set of the apical portion of the cement once it became anaerobic,  the manufacturer's instructions were followed and use of the lentulospiral instrument was avoided. Numerous in vitro and in vivo studies have reported adhesive failures predominantly between the dentine and cement. 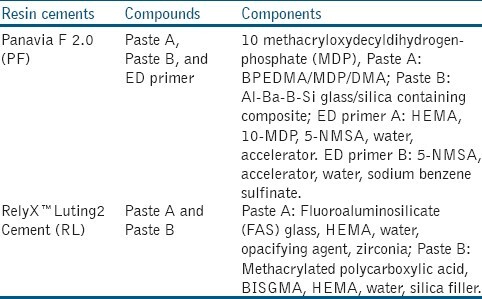 , A higher bond strength with self-adhesive resin cement, when compared with the total-etch and/or the self-etching primer group, was observed in a previous study. The failure mode of the present study also supported the same results. In the present study, the failure mode was mostly adhesive, between post and resin cement, with RL (self-cured group). Regarding the composition it was stated in the manufacturer's information that - 'RelyX Luting 2 cement was a self-curing, radiopaque, fluoride-releasing, resin-modified, glass ionomer luting cement'. Furthermore, the cement was also indicated for luting prefabricated or cast posts. Besides, a setting mechanism like glass ionomer cement, a free radical polymerization of the pendant methacrylate groups of the polymer, and HEMA (2-hydroxyetyhlmethacrylate) also took place, which was similar to a resin polymerization setting mechanism. Moreover, the free radical polymerization reaction took place without the need for light activation, therefore, it was self-curing. The additional methacrylate reactions provided for higher strengths and reduced marginal solubility, without sacrificing adhesion or fluoride release. Although cement materials had been observed around the post with PF (dual-cured group), the bond strength was found to be less compared to the RL group; which indicated that the bonding system of the PF group was not adequate with root dentin in spite of self-etching primer adhesive being used according to the manufacturer's instruction. Within the limitations of the study it was concluded that the bond strength of the dual-cured resin cement was not adequate when compared with the self-cured, resin-modified glass ionomer luting cement group, with a titanium post. Thus, the results of the study certainly emphasize the need to explore the effects of the polymerization properties of these cements at a deeper level of the root, with metallic posts. The authors would like to thank Mr. Chairul Sopian and Mr. Marzuki Yusof of Craniofacial Laboratory for their kind assistance. The study was supported by 'Short term grant, No. 304/PPSG/61311004' of Universiti Sains Malaysia. 1. Stockton LW, Williams PT. Retention and shear bond strength of two post systems. Oper Dent 1999;24:210-6. 2. Abou-Rass M. Post and core restoration of endodontically treated teeth. Curr Opin Dent. 1992;2:99-7. 3. Lautenschlager EP, Monaghan P. Titanium and titanium alloys as dental materials. Int Dent J 1993;43:245-3. 4. Cohen BI, Pagnillo MK, Newman I, Musikant BL, Deutsch AS. Retention of three endodontic posts cemented with five dental cements. J Prosthet Dent 1998;79:520-5. 5. Rosin M, Splieth C, Wilkens M, Meyer G. Effect of cement type on retention of a tapered post with a self-cutting double thread. J Dent 2000;28:577-2. 6. Cohen BI, Musikant BL, Deutsch AS. Comparison of retentive properties of four post systems. J Prosthet Dent 1992;68:264-8. 7. Preethi GA, Kala M. Clinical evaluation of carbon fiber reinforced carbon endodontic post, glass fiber reinforced post with cast post and core: A one year comparative clinical study. J Conserv Dent 2008;11:162-7. 8. Faria e Silva AL, Arias VG, Soares LE, Martin AA, Martins LR. Influence of fiber post translucency on the degree of conversion of a dual-cured resin cement. J Endod 2007;33:303-5. 9. Arrais CA, Rueggeberg FA, Waller JL, de Goes MF, Giannini M. Effect of curing mode on the polymerization characteristics of dual-cured resin cement systems. J Dent 2008;36:418-26. 10. Özcan M, Zamboni S, Valandro F, Bottino M, Bagis B. Microhardness of dual-polymerized resin cement around a translucent fiber post in the intraradicular environment. J Conserv Dent 2011;14:370-3. 11. Perdigão J, Gomes G, Lee IK. The effect of silane on the bond strength of fiber posts. Dent Mater 2006;22:752-8. 12. Kremeier K, Fasen L, Klaiber B, Hofmann N. Influence of endodontic post type (glass fiber, quartz fiber or gold) and luting material on push-out bond strength to dentin in vitro. Dent Mater 2008;24:660-6. 13. Sjogren G, Molin M, van Dijken JW. A 10- year prospective evaluation of CAD/CAM manufactured (Cerec) ceramic inlays cemented with a chemically cured or dual cured resin composite. Int J Prosthodont 2004;17:241-6. 14. Shimura R, Nikaido T, Yamauti M, Ikeda M, Tagami J. Influence of curing method and storage condition on microhardness of dual-cure resin cements. Dent Mater J 2005;24:70-5. 15. Grandini G, Goracci C, Monticelli F, Borracchini A, Ferrari M. SEM evaluation of the cement layer thickness after luting two different posts. J Adhes Dent 2005;7:235-40. 16. Vichi A, Grandini S, Davidson CL, Ferrari M. An SEM evaluation of several adhesive systems used for bonding fiber posts under clinical conditions. Dent Mater 2002;18:495-2. 17. Grandini S, Sapio S, Goracci C, Monticelli F, Ferrari M. A one step procedure for luting glass fibre posts: An SEM evaluation. Int Endod J 2004;37:679-6. 18. D'Arcangelo C, Cinelli M, De Angelis F, D'Amario M. The effect of resin cement film thickness on the pullout strength of a fiber-reinforced post system. J Prosthet Dent 2007;98:193-8. 19. Ferrari M, Cagidiaco MC, Grandini S, De Sanctis M, Goracci C. Post placement affects survival of endodontically treated premolars. J Dent Res 2007;86:729-4. 20. Zicari F, Couthino E, De Munck J, Poitevin A, Scotti R, Naert I, et al. Bonding effectiveness and sealing ability of fiber-post bonding. Dent Mater 2008;24:967-7. 21. Bitter K, Paris S, Pfuertner C, Neumann K, Kielbassa AM. 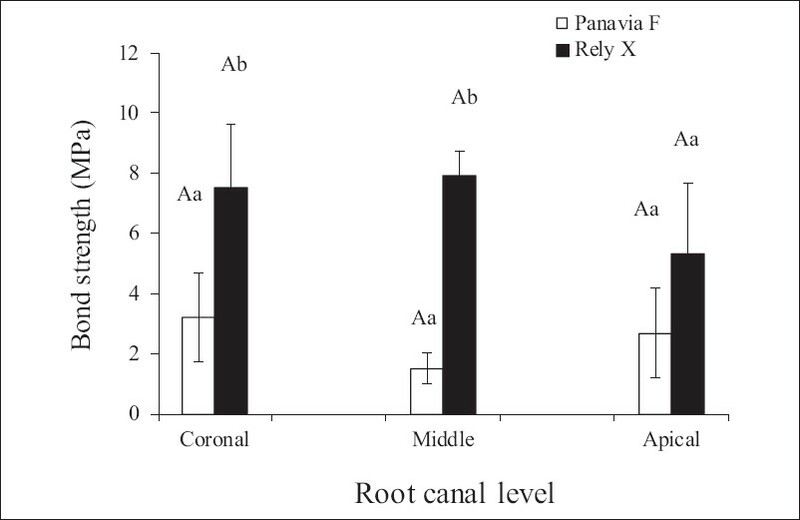 Morphological and bond strength evaluation of different resin cements to root dentin. Eur J Oral Sci 2009;117:326-33.
kadam, a. and pujar, m. and patil, c.
Dos Santos, S. and MoysÃ©s, M.R. and AlcÃ¢ntara, C.E.P. and Ribeiro, J.C.R. and Ribeiro, J.G.R.